Fr. 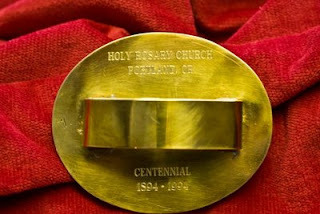 Anthony Patalano, O.P., pastor of Holy Rosary Church in Portland has sent me pictures of one of the Pax Instruments (instrumenta pacis), or "Pax-bredes" that were cast on the celebration of the Centennial of the church in 1994. As many readers have probably never seen this instrument, he suggested a posting on it. Before I leave for the north in a couple of days, here it is. The Pax Instrument (as we Dominicans call it), Osculatorium Pacis, Pax-Brede, or Pax-Board, is often simply referred to as the "Pax." It seems to have been introduced in Western Liturgy in the early thirteenth century. It has been a part of the Dominican Rite liturgy at least since the time of Humbert's Reform (1256). 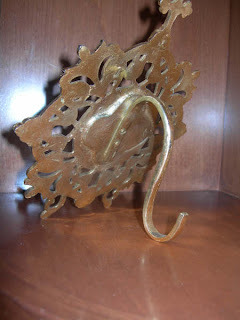 Instruments of ivory, wood, silver (as here) or other metals exist. 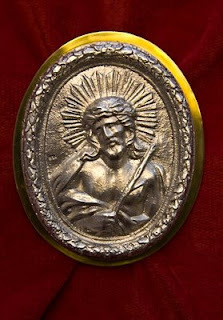 As you can see in the image to the right that of Holy Rosary shows on the front Our Savior crowned with thorns in the traditional image of the Man of Sorrows or Ecce Homo. This is one of the common images for a Pax. Other possible images are an Agnus Dei or the Crucifixion. I know of one where the image is of Our Lady. There is no obligatory image and it might even be a simple cross. The back of the instrument has a handle so that it can be presented for kissing. You can see the handle on the back of the Portland Pax, which includes a commemorative inscription, in the second picture. Use of the Instrument. In the Dominican Mass, the Pax instrument is used at all Masses of Simplex (or in 1962 terminology "Third Class") feasts and above. After the priest has dropped the particle into the chalice, which in our rite is done immediately after the recitation of the Agnus Dei, the priest recites the mingling formula and kisses the chalice. The deacon approaches on the priest's right, takes up the instrument, and presents it to the priest to kiss. He then kisses the instrument himself and descends to the subdeacon. He presents it for him to kiss, saying Pax tibi et Ecclesiae Dei sanctae. He then gives him the instrument so that he can perform the same rite for the two acolytes. The subdeacon then returns the instrument to the altar placing it on the Epistle side of the corporal, that is, unless the peace is to be given all the friars present in choir, which is done on Sundays and on First Class Feasts (totum duplex). If that is to be done, the subdeacon presents it to the two acolytes to receive and then takes it to the lead cantor who presents it to the friars in choir, beginning with the Master of the Order (if present), then the prior provincial (if present), next the local prior, and finally the brothers in order of religion. He then places it on the credence. If it is not convenient for the subdeacon to go to the choir, this task may be undertaken by the crucifer, who comes up to receive the pax after the acolytes. On the very highest of feasts, however, the subdeacon himself takes the pax to all the friars in order, accompanied by his acolyte. If the community has no pax instrument, the paten may be used in its place, but, in that case, it is not customary to have it carried to the community in choir. If a bishop is presiding in choir, he would receive the peace after the ministers but before it is presented to any of the friars in choir. There is an interesting local variant of this ritual in some places at Low Mass. It is not observed in the United States, and never was, as far as I know, at least in the Western Province. In this custom, the server at Low Mass, when he sees the priest kiss the chalice at the mingling, ascends and picks up the paten with the purificator and offers it to the priest to kiss. The priest then greets the server with Pax tibi et Ecclesiae Dei sanctae, the server himself kisses the paten and replaces it on the altar. I understand that this ritual is still observed among the Australian Dominicans. Through the kindness of one of our readers, a former parishioner at Blessed Sacrament Church in Seattle, I can now add two more images of a Pax Instrument, these made in France. 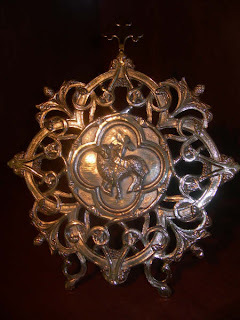 Notice that this one shows the Agnus Dei.